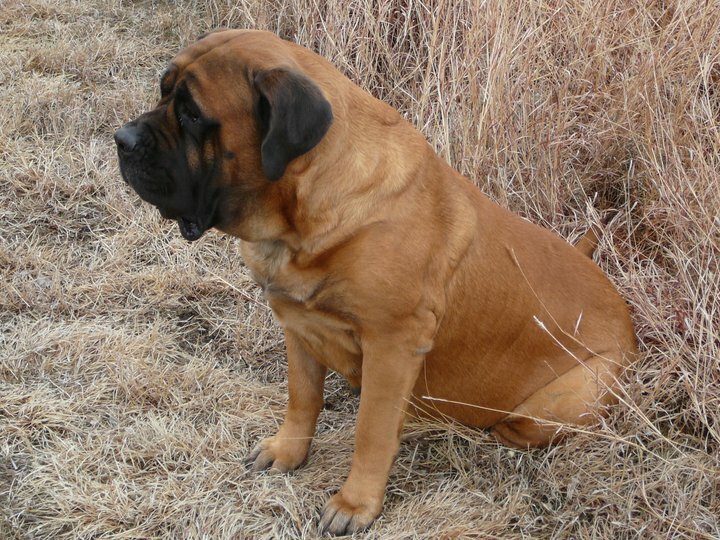 Happy 2nd Birthday - This Forum is brought to you by The Mastiff Sweet Spot and Friends of the Forum. This is our Hummer/ Mariska litter--happy birthday, love you all! Hugs and slobbery kisses from us!---momma Mariska! Susan, where are the birthday pictures/updates????? Love to see how they are growing. Grandmas are always supposed to have pictures.....please?! Tks Grandma Eileen!! They are gorgeous! Happy Birthday from great grandma Samantha. The red head looks like mom. Very pretty. Happy happy birthday to them! Our dear Hummer/Mariska litter turned eight on the March ninth. We had to let one of our beautiful apricots, Morgana, pictured above; go to the bridge on the seventh. Her full name was Magdalenes Celestial Enchantress Morgana. She was the alpha and our hearts are broke again in less than four months. She died as her mother of a ruptured tumor. We are down to two fawns and two apricots and a naughty basset hound, the house seems empty. She is also survived by a brother in Kansas City, a sister in California and a Brother on Oklahoma. We lost Magdalenes Hummin A Song For Isadora, Issie, yesterday. 3/09/09-11/07/17. We have been fighting cancer for 2 years in her and her elbow issues. She was the only one out of our Hummer litter that got the massive, beautiful head out of 10 puppies. And the only one we have ever had that got the huge elbow callouses, even though she was always a dog bed hog. We had been fighting the right elbow's swelling and then she caught it on the doorway, it split badly and couldn't be stitched. She was such a vocal girl and had taken over being boss of the house; making sure that she got her choice of beds. She is the fawn shown in pictures above...trying to figure out how to share a picture off of facebook....we are taking comfort that Eileen, daddy Hummer, momma Mariska and a crowd will meet her at the bridge and romp with her. Rest in peace dearest Issie.